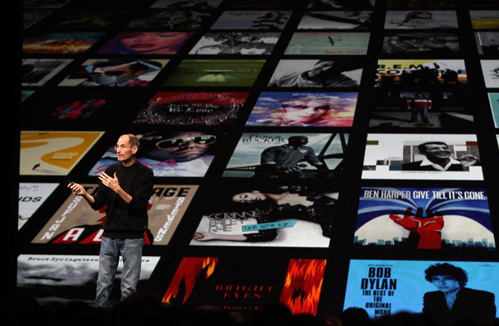 Today, Apple CEO Steve Jobs kicked off the week of the 2011 World Wide Developer Conference here in San Francisco with his keynote presentation that outlined three major technologies the company will soon be rolling out: Mac OS X Lion, iOS 5, and the iCloud service. Jobs and company began running through several of the 250 new features that will arrive with the forthcoming major update to Mac OS X, Lion (version 10.7). Among the many advances it will bring are deeper support for multitouch gestures, facilities to allow easy creation and management of fullscreen applications, and the LaunchPad system that makes for easier browsing and launching of apps — all of which bring Mac OS X’s look and feel closer that of iOS. Mac OS X Lion will be available sometime in July, exclusively through the Mac App Store as a 4GB download at a price of $29.99. Jobs then moved on to iOS 5, beginning with a look at where we are. Since the original iPhone’s 2007 debut, over 200 million iOS devices have been sold, in all, 25 million of which are iPads. There are presently 425,000 apps in the App Store, 90,000 of which were designed specifically for the iPad. And, since its debut less than three years ago, 14 billion apps have been downloaded from the App Store, generating a total developer payout of over $2.5 billion. Apple intends to grow those already impressive numbers with the release of iOS 5, a major update to operating system driving the company’s mobile devices. This new release will bring over 1,500 new APIs for developers to work with and over 200 new features. 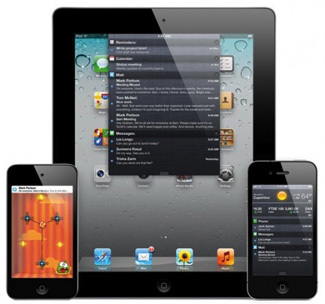 Senior VP of iOS Software Scott Forstall took the stage to detail ten of the more notable features that iOS 5 will bring. 1. Notification Center is a new component of iOS that acts as a central notification hub that can be swiped into view, presenting a list of recent notifications and the ability to jump to the application associated with each. Additionally, notifications will no longer pop disruptively onto the screen, but will appear at the top of the screen, taking the user to the originating app with a tap or fading out entirely if ignored. The iOS lock screen will also display a list of the most recent notifications, with a swipe across each taking you to the originating application. 2. Newsstand gathers the many disparate digital magazines and newspapers available on the App Store into one place and allows easy browsing and purchasing. Chosen items will be downloaded into the News Rack, which features an iBooks-like interface that shows the current front page as the item’s icon. Background downloads will allow subscribed items to updated themselves for easy pick-up reading. 3. Twitter support has been integrated into iOS, providing single sign-on (no need to re-enter password every time an app wants to access your Twitter account) and a pop-up Tweet Sheet for applications that support the new components. Those with immediate support include Camera, Photos, Safari, Maps, and Contact, the last of which can pull twitter user photos and import them into iOS contacts to put simplify the task of putting a name with a face. 4. Mobile Safari is the most popular mobile web browser in use today; nearly 2/3 of all mobile browsing is done with it. New to Mobile Safari is Reader, which provides a clean, unified rendering of multi-page stories, generated from RSS information. Reading List is an Instapaper-like system that allows webpages to be saved to a list for later reading. And, finally, tabbed browsing support will allow for easier management of multiple sites at the same time. 5. Reminders is a type of active to-do list system that can setup a “geofence" and trigger reminders based on your geographic location. 6. Camera is getting an update that will bring optional grid lines for better framing, on-device editing like cropping and rotating plus red-eye reduction. The volume up button can also be set to trigger the shutter. Additionally, a camera icon will appear on the lock screen allowing photos to be taken quickly without unlocking the device. 7. Mail under iOS will be enhanced to allow draggable addresses, indentation control, message flagging, full-message search, left / right swipe to / from inbox to message, an integrated dictionary, and support for the newly expanded iOS keyboard that can be slid upwards to split out into two thumboards. 8. “PC Free" changes have been made to iOS to allow it, for the first time, to be fully used without the need to sync to any PC or Mac. Upon first power-on, iOS devices will display a Welcome screen, as opposed to a sync notice. Software updates will now take place over the air via WiFi, and incremental “delta updates" will allow more efficient system updates. 9. Game Center has received several enhancements in this next version of iOS. Forstall indicates that there are over 100,000 game and entertainment titles in the App Store and, in an effort to further iOS as a game platform, Game Center has been expanded include user photos, achievement points, access to friends of friends, friend recommendations, game recommendations from Apple, and game downloads direct to Game Center. A framework for handling the behind-the-scenes back-and-forth needed by turn-based games has been provided as well, to eliminate the need for developers of such titles to handle everything on their own. It was noted that in just nine months, there are 50 million Game Center users, while Xbox Live currently has about 30 million users after nine years of up-time, as a comparison. 10. iMessage lets iPad users get in on iPhone-style Message app texting. It’s 3G and WiFi based, supports rich media, and works on the iPhone, iPad, and iPod touch. The system includes optional delivery and read receipts with messages pushed to all of your devices. It was also mentioned that iOS 5 will support wireless mirroring of an iPad 2 screen to an Apple TV display, WiFi-based syncing with iTunes, and will bring all of the resources of Mac OS X’s Core Image subsystem to iOS developers. The third piece of today’s keynote puzzle is iCloud, Apple’s long-rumored online data storage / retrieval system that’s designed to make life much simpler for users of all Apple devices. “Some people think a cloud is just a hard disk in the sky," Steve told the crowd. “We think it’s way more than that." iCloud stores content (think contacts, calendar, photos, music), with wireless push to all devices. But the kicker is, it’s completely integrated with apps. Everything happens automatically, invisibly. “It just works." iCloud replaces MobileMe and its core apps — Contact, Mail, Calendar — with completely rewritten version made to store data remotely and sync it with all Apple devices, Mac OS X or iOS-based. But those are just three of the nine total apps that make up the iCloud system. The App Store app has been updated to show your full purchase history from any device, with a download from cloud button that allows such apps to be redownloaded on different devices without any additional charge. Moving forward, any app purchased on any device gets pushed out to all other iOS devices. The iBooks app now works in the same fashion, as well. A Backup application wirelessly backs up all data on an iOS device to the cloud via WiFi — user data, camera roll photos, videos, books, apps, and music. If you purchase a new iPhone to replace an old, all data from the old device will sync down to the new unit. Documents in the Cloud is Apple’s solution to the complex and unnecessary nature of the filesystem on modern systems. As Jobs indicated, it “completes the iOS document storage story." This component of the iCould system allows applications to manage their own documents, syncing them to the cloud and down to all other devices. Support for Documents in the Cloud is already present in the latest versions of Pages, Numbers and Keynote. iCloud developer APIs are forthcoming that will allow storage of full documents as well as simple key value data. Documents in the Cloud supports all iOS devices, Macs, and PCs, too. Photo Stream brings photos to the cloud. Take a photo on any iOS device or import a photo into iTunes on a Mac and it is automatically moved to the cloud and synced with all other Apple devices, and the Pictures folder on Windows PCs. This allows viewing of your Photo Stream on any iOS device — including the Apple TV — or Mac or PC. Photo Stream photos are all stored permanently on Macs and PCs, with the most recent 1,000 stored on iOS devices. Photos will be stored in the cloud for 30 days, long enough for them to make their way to all of your connected devices. iTunes in the Cloud brings easy syncing of your music across all devices. Any previously purchased music can be downloaded without additional cost on any Mac, PC, or iOS device. Any future music purchase automatically gets pushed out to all connected devices. For music not purchased through iTunes, but ripped from CD or gathered elsewhere, the iTunes Match service will scan your library and allow you to download tracks that are found, at 256 Kbit AAC quality. Any tracks that were not matched can be uploaded to the cloud for access from any device. The cost for maintaining iTunes Match titles in your iCloud library is $24.99 per year. MobileMe, which was a $99 per year, subscription service is now dead. iCloud replaces it as a free service that provides all of the aforementioned along with a me.com email address and 5GB of document storage, not counting photos, videos, music, apps, or books. 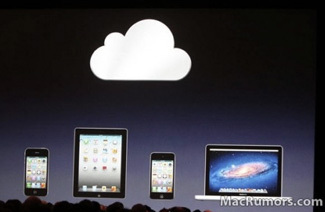 Developers can download a beta of iOS 5 with iCloud support today, and the system will roll out publicly in the fall. Apple has placed a video of this morning’s complete keynote event online.